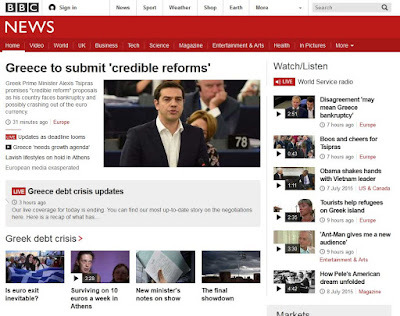 theatre of noise: BBC News as creator of the "Greek Crisis"
The coverage on 8 July 2015 primarily concerned the ongoing financial crisis in Europe, which has been playing out with Greece as an increasingly unwilling guinea pig. A few days prior (Sunday 5 July) Greek citizens voted in a referendum against the latest potential agreement with "Europe", which here means the Troika composed of the IMF, the EU Commission, and the European Central Bank. As a refresher on this issue, I refer you to the Novara Wire article "In Defence of Greece: 6 Myths Busted" [link]. The first thing we notice is that most of the screen real-estate is dedicated to this one story. So right away we know it is the news item we should care about, more important than the imminent London Tube strike, debates over fox hunting, a teen hacking story, images of Pluto, the NY stock exchange shut-down, the UN Srebrenica genocide declaration, or various entertainment and sports trivia. I will break down the page in sections. 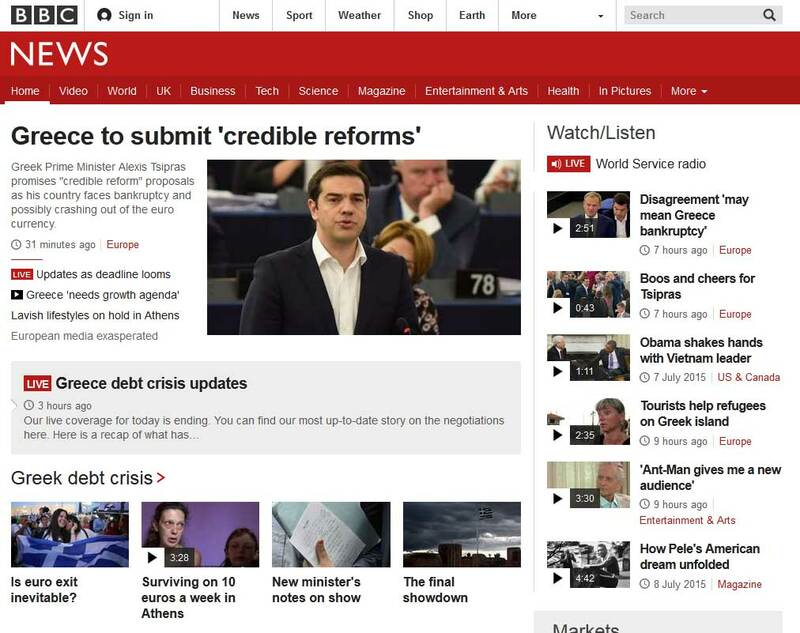 The main story is "Greece to submit 'credible reforms'", which further states "Greek Prime Minister Alexis Tsipras promises 'credible reform' proposals as his country faces bankruptcy and possibly crashing out of the euro currency." The onus here is on Greece to come up with proposals, and those Tsipras promises are put in scare quotes because they are not to be taken seriously. They are 'credible reforms', not credible reforms. Let me justify this interpretation. In a scholarly article, one would always be careful to attribute quotes in this way. Nothing malicious could be read into it. But this is not a scholarly article, it is journalism, where rigorous ethics do not apply (or more accurately, are applied only when it suits the writer). This is demonstrated by the fact that such quotation marks are used inconsistently. Note especially that the text does not state that "his country faces 'bankruptcy'", with "bankruptcy" in quotes. Though this would be the more accurate and fair syntax, bankruptcy being only one interpretation of what might happen in an unknown future. Neither is there any justification or source given for the scare phrase "crashing out of the euro currency". This is pure fear-mongering, not based on any of the evidence at hand. There is nothing to say that Greece will leave the euro if the current deal does not go ahead. Indeed, there might well be future deals or compromises. Who knows? But the BBC chooses to raise the spectre of fear. Even if Greece did leave the euro, this would not necessarily be a "crash" for them. Isn't Britain itself "out of the euro currency"? Is the British Pound Sterling a catastrophe? Is the Swiss franc something to fear? How about the Norwegian krone or Swedish krona? Quite a few European countries do not share the euro. The obvious bias even in this small fragment of text is astounding. The actual news is that Tsipras is putting forward some new proposals. 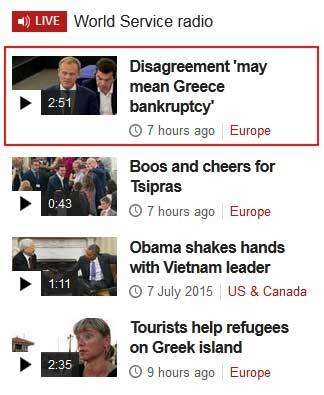 The BBC writes about "crashing", "crisis", and "bankruptcy"... none of which are inherent in this story. They are projections of the author. And when I say "author", in this journalistic context, be sure that I always mean to include his editor and also her institution. I am well aware that the actual journalist rarely gets to write cut-lines or make editorial decisions. Finally, check out the picture of Tsipras. Generally he is quite photogenic. But it's always possible to find one frame with him in mid-syllable, an older disgruntled white dude peering over his shoulder in disgust. And that's the shot they ran. The majority of readers will not follow any of these links (and I include myself in this category). So the short fragments of lead-in text are all we have to understand the story. Every word here is important. A sense of urgency is conveyed with the standard devices of immediacy (the word "live"), fear (the colour red), and "deadline". This may perhaps be the one-hundred-and-third deadline in a story that has spanned months, but no matter. It is yet another "deadline" that we must worry about. This is business as usual for a news outlet. Create anxiety, tension, and unease. Below this is the article lead-in "Greece 'needs growth agenda'". The phrase is in quotes but we don't get to know who said it. I would guess that Tsipras made the quote, since no-one else is considered untrustworthy enough by the BBC to need their words in quotes. All other opinions are granted the weight of fact. "Lavish lifestyles on hold in Athens" is the next headline. No quotes, naturally. This strongly implies that the spend-thrift Greeks (a cultural stereotype carried in many stories prior to this) have been abusing all the money lent to them up until this point. Now they must finally berth their luxury yachts, give leave to their servants, and put the Bentley up on blocks. The truth is of course quote the opposite. Greeks have for years been bearing the burdens of a brutal austerity programme imposed by the Troika and enforced by the previous government. This has brought the country's economy to its knees. A huge fraction of the workforce are unemployed. Greek banks are closed. People queue to get out their allotment of 60 Euro a day. Citizens are bartering for essentials. But the BBC reminds us of the "lavish lifestyles" of Athenians, ignoring the Troika members who pocket annual fees of half a million euro, and more. The final headline is "European media exasperated". Naturally this overlooks the fact that reporters from many media outlets are overjoyed that Greece is standing up to the banker bullies. But by all means let's stress the negative and emotional. "It's so exasperating that these Greeks don't do what they are told!" This headline reaffirms that this is a Greek crisis, and just below (next image) is yet another section header "Greek debt crisis". All this repetition certainly drives the agenda home. But it should make an intelligent person suspicious. What are the facts? Greece was given two bailouts between 2010 and 2014, totalling 230 billion euro. What was this money used for? Did it go to needy people or the infrastructure of the country. No. The banks took the vast majority of the sum and used it to bail out their investors and their own bad dealings. In fact, they were able to make a tidy profit on the deal, a process detailed in the Foreign Affairs article "A Pain in the Athens" [link]. Only an estimated 27 billion of the bailout money went to the Greek state. "Indeed, by 2013 Greece was running a surplus and did not need such financing", writes Mark Blyth. I urge you to read the full article, which concludes that "Greece has very little to do with the crisis that bears its name". So, by repeatedly referring to this story as the "Greek crisis", the BBC is at best distorting the truth, at worst engaging in flagrant propaganda. And for whom? Why the Troika, of course. The unrelenting point of view continues to be reinforced in these links to further articles. "Is euro exit inevitable?" No, of course not. But the very asking of the question makes the answer inevitable. In response, I'd like to propose a different question: "When did you stop beating your wife?" "Surviving on 10 euros a week in Athens" seems to contradict the previous headline about luxuries. We are presented with a thumbnail of a skeletal woman who can elicit nothing but our pity. The eye is drawn immediately to this gaunt visage. "The final showdown" continues the brinksmanship. It's final; there will be nothing afterwards, even though politics is a continuous process. It's a showdown, like some sort of a sporting event. And the dark, dark clouds are closing in on the emblem of Greece. One could easily laugh at the facile symbolism. The sidebar continues in exactly the same fashion, drilling the relentless bias into the reader. "Disagreement 'may mean Greek bankruptcy'" finally puts that word in quotes where it belongs, but the sheer repetition of the phrase, as already seen, creates its own reality for the reader. Where is the article "Disagreement 'may mean Greek freedom'"? We might well ask this question, were we not already so pessimistic. "Boos and cheers for Tsipras". Naturally this headline puts the negative first. It's not "Cheers and boos for Tsipras", even though the referendum passed with a majority of Greeks on his side. The strangest entry is "Tourists help refugees on Greek island", which again makes of the Greek people objects of pity, who need to be bailed out by foreigners. Nowhere are the citizens portrayed as autonomous creatures with their own political will, despite the fact that they have demonstrated that, of all people in the EU, they are the ones taking the stand. Ministers turned down the Greek government's request that the Greek people should be granted a single week during which to deliver a Yes or No answer to the institutions' proposals – proposals crucial for Greece's future in the Eurozone. The very idea that a government would consult its people on a problematic proposal put to it by the institutions was treated with incomprehension and often with disdain bordering on contempt. I was even asked: "How do you expect common people to understand such complex issues?". Indeed, democracy did not have a good day in yesterday's Eurogroup meeting! For Varoufakis this raises one simple question that lies at the heart of the current debacle: "Can democracy and a monetary union coexist? Or must one give way?" I believe this question has been answered by the fact Varoufakis stepped down from a position that, for him as a moral being, was increasingly untenable. But the situation is more dire than even his prognosis. In truth, it is morality itself that is incompatible with the monetary union on the one hand, and centralised media on the other. Further, it is increasingly difficult to deny that morality is incompatible with democracy itself. But I suppose that is another article.